This book thoroughly explains the surface etching technique on glass and how to get started yourself. It starts out by explaining what abrasive (sandblast) etching is all about and how it is done. 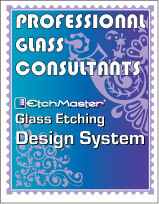 Then, design for glass etching is explained as well as the materials required for successful etching. Preparation of the glass for etching and the actual etching process is covered next, along with comments on finishing the etching. Suggestions for etched projects are made in the following chapter, then there is an explanation of the equipment required and safety procedures. This book is a great place to start learning about etching. However, many people who already know surface etching techniques get this book just for its selection of patterns! 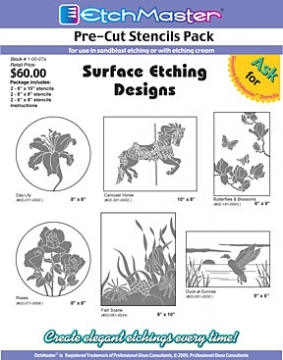 After the instructional portion, there is a design section of over 100 patterns for surface etched designs. There are over 30 photos of finished projects in full color, ranging from small gift items to full sized glass door panels. 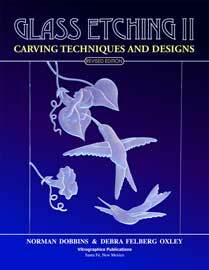 This is THE book you need to start abrasive glass etching. 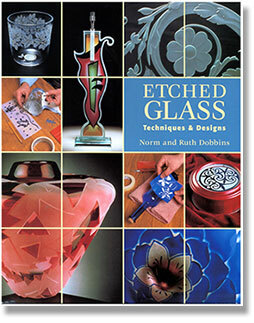 But experienced glass etchers buy this book too - just for the patterns! Don't miss this new, revised book - order now! Why glass etching? What is glass etching? Chapter 6: Now what can you make? 103 glass etching designs from gifts to doors and larger!